El Niño/La Niña–Southern Oscillation of Pacific Ocean is not the only thing that is an obstacle in the way of monsoon season but there is a similar phenomenon in the Indian ocean that has an impact on the monsoon seas though it affects less number of countries than the ENSO conidtions. What is it? It is the Indian Ocean Dipole (IOD), this year it is the only thing that is giving threats to the upcoming monsoon season especially to Pakistan! Positive Indian Ocean Dipole (IOD) causes sea temperatures to rise in the western Indian Ocean with heavy precipitation in Sub-continent while it makes the sea temperatures cooler in the eastern Indian Ocean with drought or very little to no precipitation in Australia and Indonesia. Negative Indian Ocean Dipole (IOD) causes cooler sea temperatures in western Indian Ocean with less rainfall in the Sub-continent while eastern Indian Ocean becomes warmer with heavy precipitation in Indonesia and some parts of Australia. 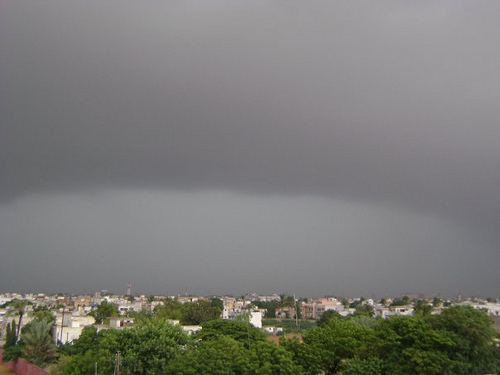 Early Monsoon – Danger during last months? According to the American and Australian experts, a negative Indian ocean Dipole is very likely this year that will remain towards the end of Monsoon season. According to their models which show that a sharp transition would take place during last week of May as shown in the above chart which will result in the formation of a negative Indian ocean Dipole hence the onset of monsoon would be delayed in western India and all over Pakistan, these areas will continue to witness below normal rains till the end of monsoon. The Australian Meteorology also points towards cooler temperature in the Pacific Ocean that might led to a weak La-Nina later in the year. 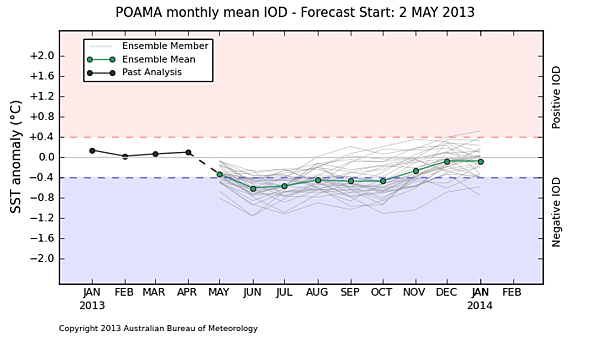 Four out of five Australian models hints towards a negative Indian ocean dipole during the upcoming monsoon season. The Japanese on the other hand were the first to point out that negative Indian ocean Dipole would develop this year though they are little cautious this year as their model failed last year to predict the sudden development of positive Indian ocean dipole during last days of monsoon season that in return caused heavy flooding in parts of Sub-continent. According to their model, monsoon could create some problems in some places of north-eastern, central and adjoining north-western parts of India though at the same time, the same model that is forecasting for Negative Indian Ocean dipole is forecasting a weak La-Nina later in the season. South Korea-based Asia-Pacific Climate Centre have ruled out that there will be below normal rains this year in the sub-continent. Their model expects overall normal to above normal monsoon rainfall during June and July while slight decrease in rain-coverage in the month of August. The forecast of Indian Meteorological Department (IMD) has not mentioned the Negative India Ocean Dipole development, in simple words they have completely neglected the Indian ocean Dipole phenomenon therefore they believe on a normal monsoon season. 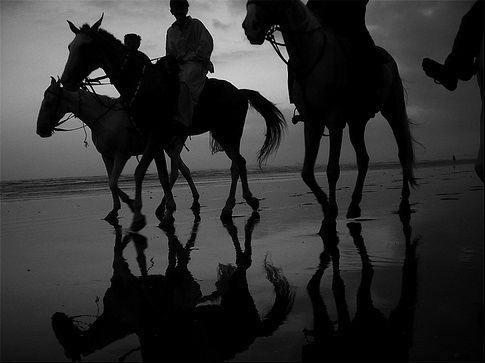 June 1 – Kerala, PWP had predicted that it will hit early than IMD’s June 3 forecast. Two low pressures formed in the Arabian sea both were unimportant for the sub-continent. In the both of Bay of Bengal, two depressions formed, in which one of intensified into a cyclone ‘Mahasen’. So far the sea surface temperatures of the Pacific ocean are neutral though later this year a weak La-Nina can develop during late July/August and during this period the negative India ocean dipole is expected to peak, both of these phenomenons will influence the monsoon season. So far the monsoon has been vigorous over India as 26% above normal rainfall has occurred. 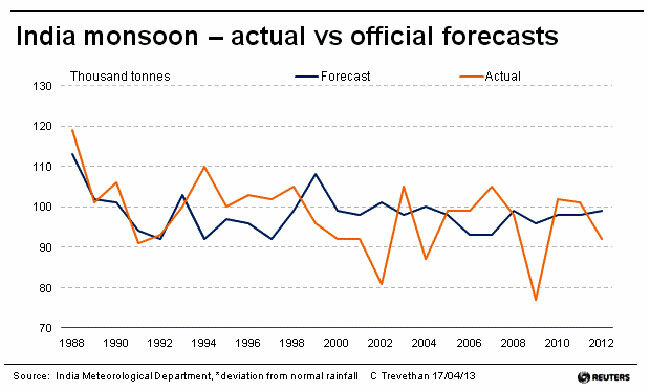 From June 9, the monsoon coverage in the sub-continent would increase significantly. Two low pressure from the Bay of Bengal can move towards central India, another circulation can form in the North Arabian sea. The current moisture over Oman today plus the break in the Pakistan-Arabian Dust cloud for the last few days, may move that block of moisture towards the coast of Pakistan shortly. Over the next six months, the absence or presence of the Dust Cloud over Pakistan will probably be a stronger factor for floods, normal rainfall or drought conditions, as they have matched exactly, over the last few years. Hmmmm, last year’s monsoon was a disappointment! baber bhai buri khabar sunaee ap nay. . .ramzan aur garmiyan monsoon k baghair kaysay guzrain gi . . .i was so excited that monsoon crept early this year and expecting a longer rainy season this summer. . .bt ur article made me worried. . .Allah kray ap ki ye prediction ghalat sabit ho jaiy. . .waiting 4 a gud news frm u in coming days. . 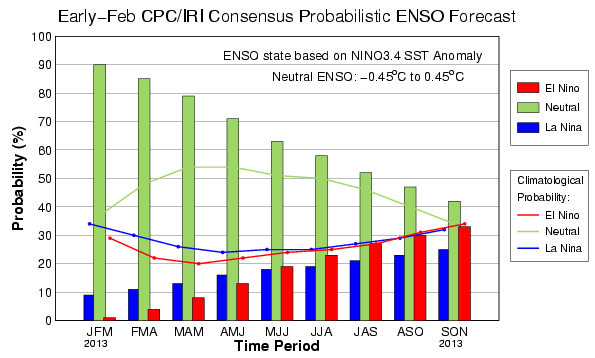 There is a possibility of a weak La Nina in late monsoon season as mentioned in the article. This La Nina can bring good rainfall across whole of the country so you must be happy. Monsoon is still expected to start early but we cant ignore the emerging factors. Indian ocean Dipole is as important as ENSO conditions. Since the publishing of monsoon one, I was hoping that IOD would not materialize but it did! lol I wish the opposite occurs.. Pray for a positive Iod!!! This is the reason why Karachi is one of the dryer places in the world, except for few good years of moonsoon. low Pressure high pressure, NO Pressure ?? These are conditions and are observed everywhere. The thing is that these conditions just don’t favor Karachi. lets wait jani 😀 ……..
Babar bhai,Please explain Monsoon rains in south Punjab would normal or above normal as did not give any forecast about that in your any article. Yes for South Punjab chance of Normal to below normal. This year the dust cloud dissipated. Looking at the new maps, it shows the it will come back again. You people should know about global warming.This warming of oceans will cause heavy monsoon precipitation because there will be more water vapor in the air.As for now -IOD will have little effect as it will be cancelled by La-Nina.It is all about what Allah has in store for us.May it be a blessing not a curse. babar bhai you should issue a detailed forecast for ramzan before starting of ramzan. Simply based off intution I was suspecting a less active monsoon because the past three years have been way above normal for several stations of Pakistan. Very interesting article by the way, and beautiful flow of language. But unfortunately, less rainfall is expected. ALAS! Let’s just hope that drought conditions don’t develop!! Central and southern areas are my concern for this monsoon especially in late season. Hope some it gets +rains in the beginning. Oh I totally know what you mean! May God provide Pakistan with sufficient water for the year to come. Yes there are chances of rain during the coming late week, check monsoon of Pakistan. babar bhai i have request for you that when you issue weather update or monsoon forecast you did not mention separate forecast for Khyber Pakhtunkhwa and Balochistan as of Punjab and Sindh. So i request you to issue separate forecast for all the provinces of Pakistan. All provinces forecast are mentioned in it. Most of Balochistan is not a monsoon region. Small part of Khyber Pakhtunkhwa is not a monsoon region. Red rain, check it on the home page. Are there chances of heavy rain in Karachi?Many forecasts now showing less rain for Karachi unlike 3 days before.Is it going to be a sad monsoon for south? It still depend upon the movement of thunderstorms during the coming week though chances of rain persists. PWP ! I want to know Larkana weather is there any chance of heavy rain in larkana from 12 june ? There are chances of rain, could be moderate but not heavy at the moment. babar bhai officials of pmd saying that coming rain spell from wednesday is not a part of pre monsoon. pre monsoon will start in the last ten days of june. It is pre-monsoon, cloud movement is from India (only happens during monsoon season) though I havent seen PMD forecast on upcoming rains, I think they havent mentioned it yet. Our Chief Metrologist (PMD) don’t have any idea about coming monsoon rains. After 2/3 three days northern areas will get good pre monsoon rains. all forecasting from usa or japanese would be failed……. be ready for 300 to 400 mm in karachi…. inshallah…. might get more if we lucky…..
Read This….. Karachi may get an average year’s rainfall within a few days of rain till 18th June if the GFS forecast works. Yes, would be unusual but would be welcomed as after June and first weeks of July, at the moment no good chances of rain in the following months. yes i read that…. so keep ready urself for the fun… i dont think so that the following month would be drier… i m looking this year would be like 1994… when 475 mm fell down …… in karachi………………….. Yes there are slight chances..
hyderabad m rain kb hoge?